Framed Ford Times Charley Harper Tile Tile by Motawi Tileworks Made in the USA. This is a Ceramic Motawi Ford Times Charley Harper Tile in a 6"x8" size made by Motawi Tileworks in Ann Arbor, Michigan. The tile is 5/8 thick and is framed in a Mitered Oak Park Frame made by Dard Hunter Studios. The Frame is made from quartersawn white oak. The frame measures 9 3/4" by 11 3/4". The tile is held in place with metal clips which can be easily removed to change out the tile. 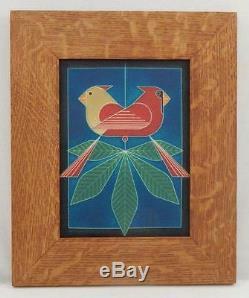 The frame has a keyed slot in the back of the frame allowing for easy hanging. Hardware is included for hanging. The item "Framed Arts and Crafts Motawi 6x8 Ford Times Charley Harper Tile E984" is in sale since Thursday, September 08, 2016. This item is in the category "Crafts\Handcrafted & Finished Pieces\Home Décor & Accents\Table Décor". The seller is "arts_and_craftsman" and is located in Painesville, Ohio. This item can be shipped to United States, Canada, United Kingdom, Denmark, Romania, Slovakia, Bulgaria, Czech republic, Finland, Hungary, Latvia, Lithuania, Malta, Estonia, Australia, Greece, Portugal, Cyprus, Slovenia, Japan, China, Sweden, South Korea, Indonesia, Taiwan, South africa, Thailand, Belgium, France, Hong Kong, Ireland, Netherlands, Poland, Spain, Italy, Germany, Austria, Russian federation, Israel, Mexico, New Zealand, Philippines, Singapore, Switzerland, Norway, Saudi arabia, Ukraine, United arab emirates, Qatar, Kuwait, Bahrain, Croatia, Malaysia, Brazil, Chile, Colombia, Costa rica, Dominican republic, Panama, Trinidad and tobago, Guatemala, El salvador, Honduras, Jamaica.